ESSENCE has announced that music legend Prince will headline the 20th anniversary Essence Festival in New Orleans on Fourth of July weekend in 2014. Prince last performed at the ESSENCE Festival for its 10th anniversary, back in 2004. Anyone have code for Ticketmaster? Essence?,.....Bueller? on line can't find it...thought it was #YES WE Code or # YesWeCode...does any one know differently? And He is opening instead of closing Friday not Sunday! Anyone have any clarfication? Friday, July 4th - Mainstage: Prince, along with special guest performers. Superlounges: Eve, King, Stephanie Mills, Leela James, Naughty By Nature, Kevin Ross, Estelle and Greta Prince. Saturday, July 5th - Mainstage: Mary J. Blige, Jill Scott, The Roots, Ledisi, Tank. Superlounges: 112, Big Sam’s Funky Nation, Michelle Williams, Tevin Campbell, Liv Warfield, Marsha Ambrosius, PJ Morton, Doug E. Fresh and Kourtney Heart. Sunday, July 6th - Mainstage: Lionel Richie, Charlie Wilson, Erykah Badu, Tamar Braxton. Superlounges: Robert Glasper, Amel Larrieux, K. Michelle, Sebastian Mikael, Raheem DaVaughn, Sevyn Streeter, Elle Varner, August Alsina and The Original Pinettes. Friday, July 4th - Mainstage: Prince, along with special guest performers. Superlounges: Eve, King, Stephanie Mills, Leela James, Naughty By Nature, Kevin Ross, Estelle and Greta Prince. Saturday, July 5th - Mainstage: Mary J. Blige, Jill Scott, The Roots, Ledisi, Tank. Superlounges: 112, Big Sam’s Funky Nation, Michelle Williams, Tevin Campbell, Liv Warfield, Marsha Ambrosius, PJ Morton, Doug E. Fresh and Kourtney Heart. 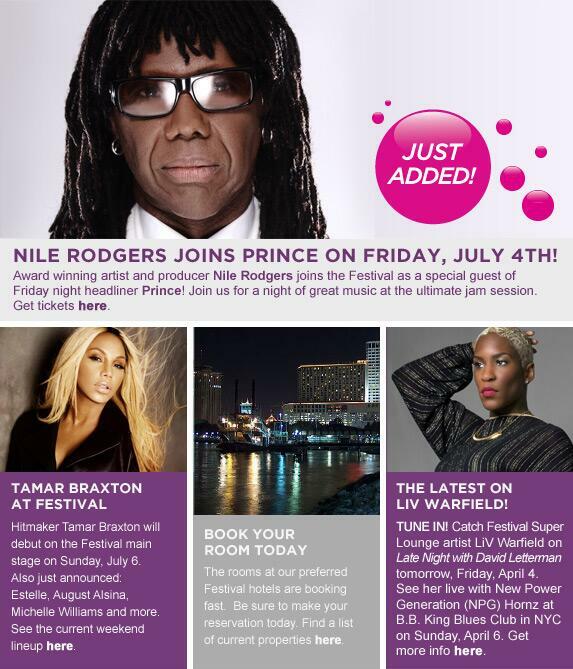 Sunday, July 6th - Mainstage: Lionel Richie, Charlie Wilson, Erykah Badu, Tamar Braxton. Superlounges: Robert Glasper, Amel Larrieux, K. Michelle, Sebastian Mikael, Raheem DaVaughn, Sevyn Streeter, Elle Varner, August Alsina and The Original Pinettes. I bought 4 tickets that I now can not use if anyone is interested in buying. They're decent seats sitting in section 141, seats 9-12. I was all set with reservations to be there including air and hotel, thinking he was ging to close the show on Sunday. There's no way I'nm getting a hotel on the 4th of July at this date that's either reasonable or in a safe area. It's going to very difficult to find a hotel in N.O. at this point and one that is reasonable. I consider $150.00 - 200.00 reasonable. However, it took me a week to find one in that range and a hotel that wasn't a dump or in an shady neighborhood. It took lots of research and going and various travel booking sites. Most hotels were either sold out, wanted a 3 night minimum because of the holiday weekend or were outrageously priced at $500.00 per night. The festival gets booked pretty far in advance and as early as 10 months away. Totally bummed not to be going, but if you are fortunate enough to find accomodations and I still have the tickets, I will be more than happy to pass them along to you. I'm also willing to sell them in pairs or as singles since there are four of them. Interesting to see the other acts and how many of them he's worked with. Nile Rodgers headlining for Prince @Essence. These are the legends who Prince should be working and collaborating with, not a bunch of no-talent schoolgirls!!!! Worling with young people keeps your mind fresh....but i like Nile to be part of the Essence xperience. What?? So u can appeal to the Beebo, 1Erection, Lady Gargoyle crowd???? You realize that when Prince was young, people from the older generation were just as dismissive of him, right? Bieber and 1 Direction, well there's been teen idols always. But Gaga is actually an incredibly talented piano player and vocalist. Have you tried the Bed and Breakfasts and or joining other orgers to share 2 of the 3 days and split the cost. Also, try Triple A rates for additional rooms not set aside by the Essence block of rooms. Priceline and the Airlines will sometimes beat and/or match most of the listed prices. I will be praying for you to prosper either way to either attend the concerts with a wonderful hotel package deal and/or successfully selling your tickets. Actually I'm hoping maybe I can buy one of the tickets in the near future, if you have one left. How was Liv Warfield at B.B.Kings in NYC Sunday...fabulous I hope! Yes it was. Made a short comment about it, in the Assoc Artists' section. I had a good Triple A rate for the hotel that I had booked, which was July 5th - 8th. I booked that back in February and most hotels were already sold out or wanted $500+ per night. Needless to say by the time the single tickets went on sale and it was announced the Prince was opening, hotels are booked solid. The only things that available are motels with a 1 star rating or something too far away. Priceline is not cooperating - I've tried every venue/site I coudl think of. If you're still interested in the ticket, let me know. how did you buy tickets for the 4th of july but book a room for the 5th?Plus you can kill 10 or 12 hours after the show easy...especially if its an aftersow till you can get your room. Single night tickets were not on sale yet when I booked the hotel. Only packages for the entire weekend were on sale. I was told he was closing the festival, therefore, I booked the room accordngly. Really surprised about the lack of posts about the gigs. Heading to Manchester now. Can't bloody wait! Sorry posted in wrong thread! The 3rd of july is fast approaching any one making party plans....I havent been to a show in 10 yrs since he last come down south in 2004 . My mom and I are definitely going to see Prince. I just wished this concert got as much attention as the other Prince gigs. I want to know if there will be after-parties or anything. This will be my first Prince concert so I'm truly excited.